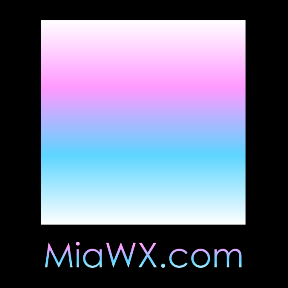 miawx.com is not affiliated with the National Weather Service, NOAA, or National Hurricane Center, all of which are sources of the weather information appearing on this website except as specifically noted. None of the content is guaranteed or represented as timely or reliable by miawx.com. All of the content is copyright by the owners of same, except that which is in the public domain as determined by the respective owner thereof, subject to the terms set forth on the source websites. Please review carefully the disclaimer of the National Weather Service, incorporated by reference herein.